This book was about to be discarded before I rescued it from the rubbish bin. I kept it on my shelf for years, gathering dust, not sure if to read or not to read. That was the question. I finally read it and regretted why I did not do so for so long. 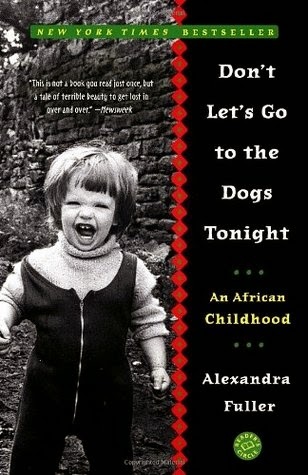 Don't Let's Go to the Dogs Tonight is too real to be true, a larger than life non-fiction that narrates on the childhood and growing up of Alexandra Fuller in the southern part of Africa. Her parents participated in the Rhodesian war, a fail attempt to establish the white supremacy. Having lost the war, they moved to Malawi and then to Zambia where they finally "settled". Her parents were reckless and racists who wallow in their ignorance. I am not surprised that her mother at some point ended up with a nervous breakdown, stark raving mad. Nevertheless, this is a memoir that I highly enjoyed, Alexandra Fuller was blunt and true to her self and her readers in narrating her memoir. I might not like some of the stories narrated therein, but it is her story not mine. It was an amazing read, extraordinary and striking. I had this desire to read on and non stop. It kept me on the edge of my seat. Incredibly moving. I highly recommend, 5 star read. I would also strongly recommend Zenzele: A Letter For My Daughter right after reading this non-fiction. Both were set in Zimbabwe. Don't Let's go to the Dogs Tonight was nominated for the Guardian First Book Award 2002, won Winifred Holtby Memorial Prize and the Book Sense Book of the Year for Adult non-fiction 2003 (previously known as American Booksellers Book Of The Year Award and now know as Indies Choice Book Award), A Thousand Splendid Suns by Khaled Hosseini also won Book Sense Book of the Year Award for Adult Fiction (2008). My copy of this book was published by Random House Paperbacks New York, 315 pages. I've had a similar experience with another book called Foundation by Isaac Asimov; I'd put off reading it for so long, only to finally read it and have my mind blown away. I'd definitely be keeping an eye out for this one. Thanks for sharing, Mary, and keep up the good work. Hey Michael, longest time. Checking out my nomination right away. Thanks for the shout-out. A lovely review, Mary. I will be looking out for this book over here, probably in the used books section at the Book Trust. I am more than sure you'll enjoy it. Kind regards.